You can use this site to review my talk or to follow the many references and resources. If you didn't attend, you can catch up right here. I hope this material will be of help to students and to anyone wishing to research the topic further. You'll find links to organizations, readings, maps, museums, and other helpful material. This page is not static, but dynamic; it will grow over time. So come back and visit whenever you need an archaeology fix. Pass on the web address (http://warwickma.blogspot.com) of this blog to anyone who may be interested. Only the Multimedia links require a high-speed internet connection. This site contains over 100 links to resources, including all of the slides presented. Links appear in this color in the text and righthand sidebar. As you move the cursor toward the link, the arrow changes to a pointing hand. Before you click a link, be sure that you know how to return to this page. Clicking RELATED LINKS • Home should do the trick. If you like this site, bookmark it in your Favorites. "There were no reported native Contact period sites. 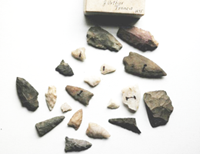 The area's rugged terrain and absence of high quality agricultural land and large freshwater ponds or lakes suggests period occupation was limited to small to moderate sized fishing and hunting encampments." "There are no documented archaeological sites recorded with MHC." "MHC" means the Massachusetts Historical Commission. This is not to say that native Americans never lived in or visited Warwick. We just have no evidence that they did so. "Period sites probably focused on the relatively level land in the general vicinity of Warwick village and south to Hastings Pond, the hill overlooking the previously-mentioned pond, the hill immediately southeast of Richard's Reservoir and the mixture of dry and marshy lowlands south of Moore's Pond." Warwick Free Library should acquire titles in archaeology, native Americans, and local history. Schedule a historic map presentation by David Allen. Reprint Morse's history of Warwick. Invite a professional archaeologist to speak. Plan an event for the 2013 Archaeology Month. If you need any more information, help with viewing the linked resources or downloading maps and books, you can reach me at 498-5742 or wwschweik@yahoo.com. Please let me know if you find an artifact or know of a private collection. Give me a ring if you'd like to visit any of the sites. I'm grateful for Ed Lemon's invitation to address the Warwick Historical Society.